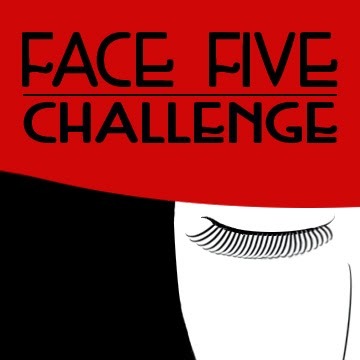 I got tagged by one of my favorite blogger girls Shalunya from Shalunya & Boyet for the Face Five Challenge. Check out her blog- she is awesome- not only does she know how to score great deals on make up items but she is also one smart and quirky writer. I love that she buys a lot of drugstore items so I can just go and check her reviews if it is worth buying- saves me a bunch money! She and Tanya from Leopard Lace & Cheesecake, Betti from Makeup' Asylum, Ashley from Ashley Maria and Keisha from The Chrysalis Gals created this fun tag. The rules are easy: Create a full face look with only 5 items! 1. Use Five and only Five products to create a complete makeup look. 2. Each different product counts as 1 product. Multipurpose products count as 1 product, such as Benetint, Bombshell the One Stick, Nars Multipurpose Stick. 3. No palettes are allowed. No trios, quads or multi-shade palettes. So here are the items I used for this challenge. 1. Fit Me Foundation Stick from Maybelline- this works great as a foundation but you can also layer it and use as a concealer. 2. Lancome Eye Shadow in "Madison Avenue". I used this not only to line my eyes but also for my eyebrows. 4. Lancome lipstick in "Pink to the Club"- I used this for my lips and also as an eye shadow. Have fun with this tag- I certainly had!